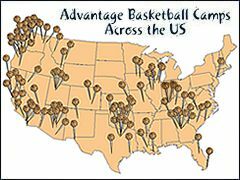 Your kids will grow and learn about more than basketball at an Advantage Basketball Camps' session. While they practice ball-handling, dribbling, and shooting, they will also learn about self-esteem, teamwork, and the value of hard work. Your child will learn using the most advanced sports coaching and training methods in use today. Our techniques have been developed over 20 years to motivate kids to learn through repetition, with fun. The summer 2019 camps will consist of 1-5 day sessions for boys and girls of all skill levels, from 6 to 18 years of age. Locations include Arizona, California, Colorado, Florida, Georgia, Idaho, Illinois, Indiana, Iowa, Kansas, Kentucky, Louisiana, Missouri, Montana, Nevada, New Mexico, New York, North Carolina, Oklahoma, Oregon, South Carolina, Tennessee, Texas, Utah, Washington, and more. You will see your children gain an improved positive attitude, greater appreciation for good moral values, and a better understanding of the keys that will lead to their own success. The sport is basketball, but the most important element is the children's future development.